Walk into any given bar lately, and in addition to the myriad of NFL schedules and drink specials, these days you are likely see the faces of Mixed Martial Arts: the Kimbo Slices, the Chuck Liddells, the Fedor Emelianenkos. It’s no surprise that since the continued success of UFC, newer companies are trying to elbow their way in to get a piece of this moneymaking pie. With the advent of Elite XC, Affliction and Dream (as well as the buyout of Pride and the changes made to the WEC), MMA has been gaining serious popularity throughout the country and even the world. However, the popularity of MMA is not limited to the national level. In many locales, smaller organizations are popping up and offering the beginning fighter the chance to showcase their skills and work their way up the food chain. Such promotions (Battle Cage Xtreme, Caged Fury, CageFest Xtreme to name a few) rely on local talent to put on a show and generate interest in the sport. Understandably, organizations both large and small tend to target college-aged guys and up, roughly from 17-35, to watch and/or participate in MMA. And how else do you get guys to start fighting, but to open up a gym? Drive through virtually any larger city and you will find an MMA training center to work on your BJJ, brush up on your Muay Thai or learn grappling. These days it seems gyms can’t open their doors fast enough to accommodate the influx of new students. But for one city in Northern California, they were all too happy to take on the challenge. Opened by fighter-turned-coach Jason Pietz and partners Marc Lewis, Cedric Schwyzer and Jeremy Rosales, the Chico, CA gym offers classes in BJJ, Muay Thai, Kickboxing, Grappling and Wrestling at a variety of levels and for women as well as men. Jason Pietz is no stranger to the cage (most recently having defeated Vincent Perez at FCP-Malice), so students are able to train with one of the best. He has trained at many of the top camps over the last 14 years, traveling hours a day in some situations. And his history speaks volumes. Having trained with the legendary Ken Shamrock, Pietz was one of the top guys on his fight team years ago. In the book Beyond the Lion’s Den, Jason and Ken are featured in almost every photo shot. After the Lion’s Den, Pietz went to train at the American Kickboxing Academy in San Jose, CA. A well-known gym, Pietz actually came up through the ranks with a lot of the top stars you see today: Josh Koscheck, Jon Fitch, Josh Thompson etc. Ultimately, to his disappointment, Jason was traveling too much to train there. Instead, he made the wise decision to open up StandAlone MMA, LLC with Marc Lewis and a few other guys a little over a year ago. If you still don’t believe that this gym is the best, all one needs to do is look at the clientele. Famed MMA writers Erich Krauss and Glen Cordoza (who have written books on Shamrock, Couture, Silva (coming Oct 10), Fedor, BJ and the list goes on) not only train at StandAlone, but they also offer up their expertise in the form of coaching. Basically, Krauss and Cordoza are guys that roll with the top camps in the world and they bring their knowledge back to StandAlone. From the perspective of the gym, StandAlone is going to burst onto the scene within the next year. Being a new gym, they have had many obstacles to climb and are now ready to get their fighters out there. They are not your typical gym. They don’t just throw people out into professional MMA matches after a few months of training. If you fight on the StandAlone fight team you fight to win. Losing is not even considered. That might also be the reason they have taken so long to build their team. Professionally, the gym holds an 14-4 record (if you countCordoza’s fights in Thailand) and this is just the beginning. The focus for the upcoming year is getting their fighters exposure. As a matter of fact, two fighters, the 2-1Anthony Fernandez and the 6-2 Josh Hinkle, will be traveling to Chicago on the 27th to test themselves at The Ultimate Fighter 9 audition. 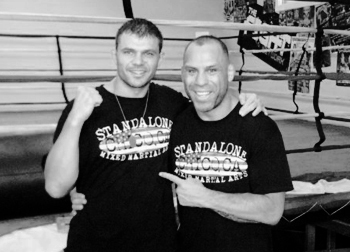 In checking out their website (www.StandAloneMMA.com), it’s clear that they have nothing but top quality fighters training and coaching there. Not to mention, these are two of the most professional, upstanding guys I have ever had the pleasure to work with in MMA. In doing the research for this piece, they were always easy to reach and always had exactly what I needed from them. I only wish that I could get to their gym to thank them for their time and efforts (and maybe partake in the Muay Thai class)! That being said, you guys seriously need to either get to StandAlone to train yourself, or you need to watch who’s going to be coming out of there. It seems to me like the fighters at StandAlone are serious up-and-comers that we will be seeing on the big stage in no time. With guys like Jason, Marc, Cedric and Jeremy as their trainers and support system, the StandAlone Fight Team will be a force to be reckoned with! Get to www.StandAloneMMA.com, check out the fighters, and check out the classes watch the videos. Then you’ll be able to say you knew them way back when!